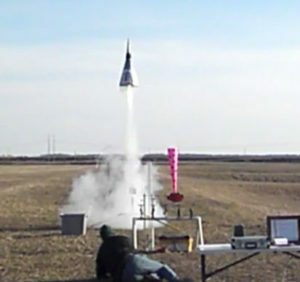 Horizontal Super-Roc comprises a single event open to any model rocket. The purpose of this competition is to maximize the altitude and the diameter of the rocket. This contest is designed to emphasize creativity in construction. The rocket must have a minimu m diameter of 12″ , as measured from the centerline of the rocket to the CLOSEST gap not designed to allow launch rod/rail access ONLY. The rocket must be able to safely fly with a motor in the “H” or “I” class. Clusters are permitted as long as the total impulse of all motors combined falls within the H or I motor class. Your score is the rocket diameter in inches times the altitude in feet, as measured by an electronic altimeter. Highest score with a safe flight wins. A single deployment entry must use parachute recovery. A dual-deployment entry does not require a parachute at apogee, but it must use a parachute for the main deployment, with a minimum deployment altitude of 500 feet AGL. With such high-drag rockets, it is possible a rocket may not reach the minimum altitude of 500 feet, and this fact alone will not disqualify the rocket, but all altimeters must be set to deploy the main at no less than 500 feet. Rockets that fail to deploy a parachute will not be considered a qualified flight. Come to the sport range, and fly your low power rocket into our prize field! A portion of the range will be divided into cells, and whatever cell your rocket lands in, you win that prize! Got a really unusual rocket? The one everyone asks “Does that actually fly?” Fly your oddest rocket for a chance to win! All rockets in any motor class can compete. Have a safe flight, and you rocket is put up for judging by the crowd at 1 PM. Glad the Pink Book is going away? Sad? Come fly a pink rocket or something that in some way commemorates the last NARAM conducted under Pink Book rules. All rockets in any motor class can compete. Have a safe flight, and you rocket is put up for judging by the crowd at 3 PM.